Phishing, pronounced just like fishing, is a term you must be aware if you use the Internet for any kind of sensitive transactions. You could be at risk of a phishing attack if you use online accounts such as Paypal or your bank account, credit card account, etc. Phishing is the criminally fraudulent process of attempting to acquire sensitive information such as usernames, passwords and credit card details, by masquerading as a trustworthy entity in an electronic communication. Communications purporting to be from PayPal, eBay or online banks are commonly used to lure the unsuspecting. Phishing is typically carried out by e-mail or instant messaging and it often directs users to enter details at a website. 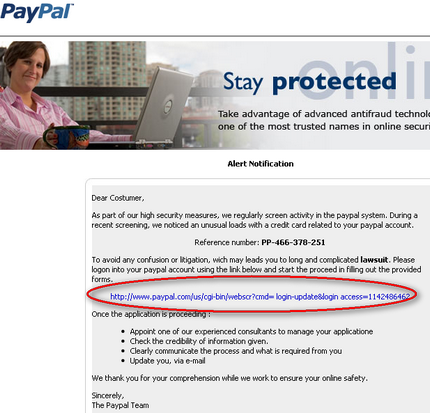 I had written on How to spot a fake PayPal email in the past and it was well received. Today, I received an improved version of another PayPal phishing attack by email. I think this is another good chance to raise awareness on such attacks and what you should be watching for. The link in the email showed the url itself that was suspicious. Once you clicked on the link, the url in the location bar was again suspicious. You should never click on these links in any emails that is from a financial place. More about it to follow. Some odd looking characters in the web page that were out of place. As you could imagine the phishing attempts are getting better and this is what I received this time around. As you can see they have gotten better. It looks authentic and they are masking the actual url with an real-like PayPal web address in the email while it is not. It’s aimed at naive Internet users and I am sure you know better than to click on it. if you were tempted, there are 2 things that should warn you before you enter your information. Again, remember it’s best practice not to click on the links in any of these emails but just go directly go to the site you have bookmarked. It is very easy to spoof an email address and make it look like an email came from someone else. But, they didn’t do that either and the from address of this email was from: paypal@securesuite.net and not a paypal.com address. 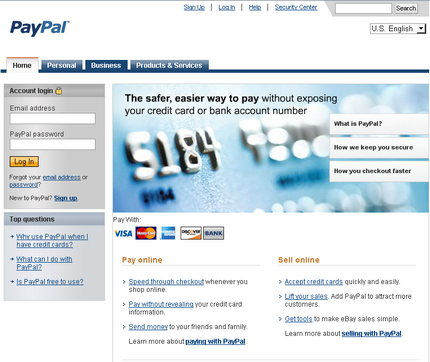 As you can see, it is very easy to mistake this for being at paypal.com as you see the words, www.paypal.com in the address. But, you are actually at http://lpdutest.com and about to give away your hard earned money to someone there. There isn’t a clue #3 this time. They have been so meticulous in forging PayPal’s site as you can see below. There aren’t even little details that have been forgotten. The language change option wouldn’t have worked if you tried but even that’s not enough to raise an eyebrow. As you can see, once you have missed the first 2 clues which is going to get harder as the phishers get smarter and find new ways to fool us into thinking that the email is from PayPal, there is no turning back. But, if you get into the habit of consciously avoiding clicking the links in such emails, there is no way they can scam you. Their whole scam relies on the email recipient clicking on the link. If you are still using an antiquated browser like Internet Explorer 6, this is a good reason to upgrade now. Any modern browser would warn you against reported phishing sites leaving you a little bit safer. But, only after someone reports about the site. So, it’s not 100% protection but better than nothing. When I received this email yesterday and I clicked on the link, there was no warning but this morning, Firefox 3 warns me that this is a web forgery attempt. I tested this in Opera 9.5, Internet Explorer 7 and Firefox 3 and they all warned me against this phishing attempt. As a savvy Internet user, you were probably familiar with this but we all know friends and family who are still oblivious to this fact. So let’s spread the word and help them from getting defrauded. What do you do when you get such an email? Update: If you use Gmail, check out the new Gmail Labs feature that helps with identifying phishing emails easily. To be honest, I’d just assume anything claiming to come from Paypal is fake and delete it immediately, if they have something genuine to say, there’ll be an announcement on the site itself, which you should visit only by entering the URL in the address bar not by clicking any links. Wow, this was good enough to fool a normal user. Pavan, that’s a good point. You’d be surprised to know that it was from Culver City, California. David, exactly what one should do. Delete the email without clicking on links. Unfortunately, there are still folks who don’t do that. Madhur, very true. I hope atleast it made a few of my readers wary of such emails. Banks themselves often break the golden rules of helping their customers avoid phishing attacks. If they were to subscribe to the idea unencrypted smtp email correspondence with their customers is not safe, and spread the word then we would have less concern. Once a number of years ago I nearly feel for one of these phishing emails but I’m much more cautious now. It’s kind of a shame because there must be lots of genuine emails I receive where I have just automatically deleted them. David, that’s an excellent idea to use false login details on the first pass. Although I’d prefer to not use the links in any such emails at all but this technique will come in handy if you are not sure if the bookmark to the banking site you have is legit or not. Your linked post is another nice example of this issue and I am heading over there to comment. April, you might be missing out on a couple of genuine emails but like David mentioned they should know better than to contact you this way. You are erring on the side of being too cautious which is the best approach towards security in the Internet, imho. That’s a surprise for me… I think you might have got mails from different bank managers/officers who would like to share a grand amount of likely 20 million dollars in some ratio…. Such ones usually have lots of spelling errors and originate from the above said sources…. Nicely done, K! I haven’t received this one yet, but have been seeing them getting more sophisticated in their presentation. Shame too, because all that effort is wasted on evil. Mark Sierra at MeAndMyDrum.coms last blog post..What Kind Of Sales Copy Ticks You Off? Another aspect of phishing that is rarely mentioned, and as it happens rarely seen is the idea of a phishing attack from an organisation or system such as AdWords or Amazon. How easy it would be for a phisher to hijack someone’s account on any of those systems where there are fewer safeguards and passwords than with one’s bank account. It even occurred to me that someone could spoof a “you have sold” email from amazon and con someone into shipping goods to a PO box from their marketplace account. I laugh every time I receive a PayPal email, because the PayPal account I use is a company account and has no associated with me directly.. But a couple days ago a fake Amazon email arrived that almost tricked me, fortunately I realized it was fake before using their login link (by going directly to Amazon.com and logging in there, where I realized there were no messages or errors on my account). These jerks are tricky though, they disguise the return email address, and have landing pages that are almost exactly the same as the real website’s landing page. This has really spooked me. I might have fallen for that one, and wasn’t aware there was anything that sophisticated to look out for. I always clicked the links in emails before, but no longer. Thanks for the heads up. Rick, they sure are and it’s only going to get worse as time goes by. Their methods will become elaborate. This is the first time I have heard about an Amazon phishing attempt as David Bradley pointed out. As long as we go to the website to login instead of clicking links in the email, we should be ok. This is a helpful post, thank you. It is amazing how many times I get spam from someone trying to pretend they are PayPal, or EBay or others. I think a lot of people that are not savvy will fall for it. technoob, you are very welcome! It’s good to see the security features being added in all modern browsers not just Firefox. But, there will always be new threats so it’s best to stay informed and how to protect ourselves. Nice post, well I recieved an email yesterday itself asking me to update my card information as it has been deactivated and finally realized its a phishing site. Good post. Many times the problem people have is they are in such a rush to read through their e-mails that they do not pay attention to the details as you have pointed out to be watched out for. I take plenty of time to scan through and if something looks suspicious, I put off reading it until later when I get a second chance at evaluating the source. Thank you for all the notes. Yup- as a general rule, be suspicious of every email that asks your for your personal information. Wow. I got a email from my local back. i rang them and they said no such thing had happened. the email is stated. we are sorry to inform you that your transaction for the [Date] Had been a fraud and we request you to go to the following link [Link Removed]. Your security is our saftly. [Bank Manager] hell how i know th wname of the manager. In the past I also received emails (from some retards, of course) in broken Slovak (I’m from Slovakia) or Czech that I should login to my bank account (some Slovak or Czech banks). It was funny how these spammers even didn’t translate the email manually, but instead they used some automated translator that left plenty of grammar errors. It’s fun when you know what it’s about. – Paypal never uses ‘dear client’, they always use the name YOU REGISTERED with them. – Simple don’t click links or when you do, ensure that the URL is http://www.paypal.com and if it’s a log in page, ensure that the connection is secure (starting with https:) and often the browser’s address bar will appear yellow. – If you’re really in doubt, simply forward a copy of the email you received to paypal to confirm it’s indeed from them. .-= Youssef´s last blog ..FarmVille Coin / Exp Hack =-. Very useful post, i always find the spamer ip / domain and report it to the authorities and also to his hosting provider.